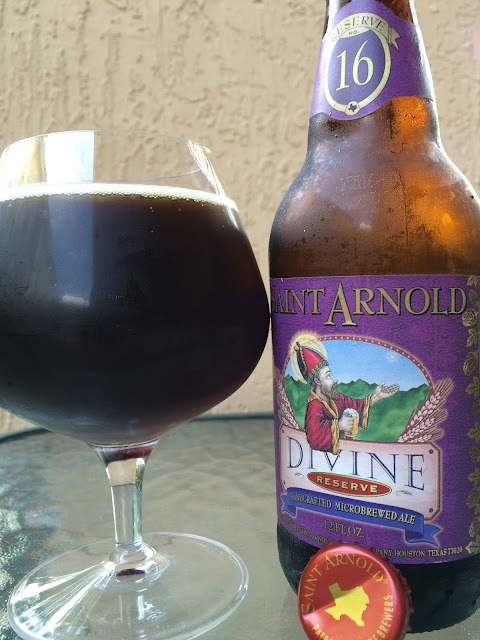 Today I'm checking out Saint Arnold's Divine Reserve No. 16. The label is purple and prominently shows the "16" but you're out of luck knowing what to expect from within (unless of course you were smart enough to Google it beforehand.) Basically, the label tells you zero. Bottled 02/18/16. So I went in blindly, hoping for some mid-ranged alcohol and approachable beer! Bam! Big aroma of cherries, caramel, brown sugar and no mistaking this beer for some alcy pop! Flavors start out similarly with cherries, prunes, cola. Some sweet brown sugar and honey also show a lot in the beginning, not to mention the aforementioned alcohol kick, slightly harsh. After a few sips, there was some char and savory character to the beer, not intense like one of those smoked beers, rather subtle yet distinct and noticeable. Some hoppy bitterness also manages to tone the initial sweetness. It turns out that this beer is brewed in a relatively rare style called an Adambier (Beer Advocate listed it as an Old Ale). And yeah, 10.0% alcohol. Lots of nuances, interesting, different.